The most important thing to consider when practicing good pasture management is the health of your soil. Healthy soils mean healthy grass and forage, which directly contributes to the health of your horse. April is a great time to get your soil tested. The results will tell you just how well the soil pH has adjusted from the lime you applied last fall. If you did not apply lime last year then the test can show you how much you will need in the fall, and allow you time to save up for it. A soil test will also show you any deficiencies you may have so you can apply a good fertilizer to get ready for the stress of summer on your grass in pasture. Before turning your horses out is a great time to make any amendments to your soil. Before turning your horse out for the first time, plan to walk all around and through your pasture. If your feet leave a trace (sink down more than 1/8 of an inch) then that portion of your pasture is too wet for turnout. If only a portion of your pasture is too wet then you can fence just that portion off until it is ready and use the remaining pasture for turn out. Make sure before turning out that your grass is at least 6 inches high. Optimal height to begin grazing is 8 inches. It is best to mow your pasture to assure even height of all grasses before turning horses out. Once the grass is grazed down to 3 inches, rotate horses off and let the grasses recover to 6 – 8 inches before turning out again. Spring pastures are a common source of colic and laminitis in horses. Annual cases of laminitis in horses in the U.S. is around 2%, but that rises to 5% in the spring, with nearly half of those coming from horses on pasture. Why is this? Because of the presence of a simple sugar that is prevalent in cool season pasture grasses (timothy, orchardgrass, bromegrass) in the spring – fructan. The products of photosynthesis are simple sugars and starch. When more sugars are produced than the plant needs for growth the excess is stored, or reserved, as carbohydrates for later use by the plant. This occurs commonly in the rapid growth observed in the spring. These reserve carbohydrates contain high amounts of the sugar fructan, stored in the stem until needed by the plant. It has been proven that administering high concentrations of fructan to horses results in laminitis. So, how can you prevent colic and laminitis when you turn your horses out on fresh spring pasture? Consider using a grazing muzzle so that the horse does not overindulge on the tasty fresh grass. Also, introduce your horses to the pasture slowly. Turn them out the first day for only 15 minutes, and then add 15 minutes a day until you reach 4 to 5 hours of consecutive grazing. This will ensure both the pasture and the horses remain healthy. Once your horses have acclimated to your spring pasture, it is vital to the health of your pasture and the health of your horse to follow good grazing practices. 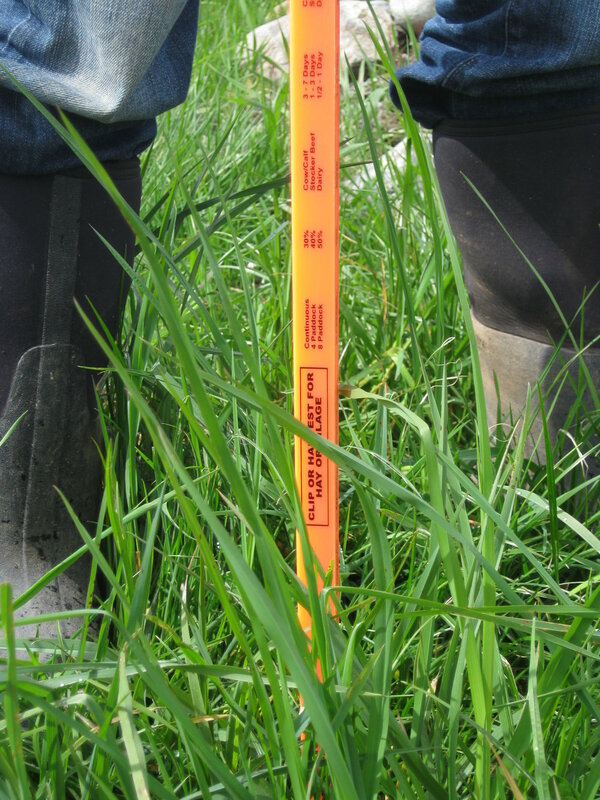 Use a pasture stick to measure the height of the grass. Never let the horses graze the grass below 3 inches. Doing so robs the plant of its ability to photosynthesize enough to support its root system and the plant will eventually die back. Also, most parasites can only survive below the 3 inch level of a grass blade, so grazing below that height is discouraged in order to avoid parasite load. Divide your pasture into sections so that you can rotate the horses through each as they graze one down to 3 inches. Rotating them onto another pasture will allow the previous pasture grasses to recover to a level that can be safely grazed again. This may take some time to figure out how many divisions you need and how long to keep the horses on each pasture. Keeping good notes of how each pasture performs will help. Pasture grasses grow at varying rates depending on many factors – rain, type of soil, ambient temperature and soil temperature. Growth rates also change with the seasons, with most grasses in western Washington becoming dormant in summer. While making a plan for rotational grazing is good, observation and adaptability are the keys to the success of any plan. If you would like help in creating healthy soil for your pasture, protecting your pasture from weeds, creating a rotational grazing plan for successful pasture management, or would like assistance with any of the best management practices out there for keeping horses, please contact us so we can schedule a time to visit your property and provide you with some solutions. And remember – healthy pastures make healthy horses…which makes for happy owners. Make it a goal to be happy this spring!